Shopping for bird care products? Duncraft, online at Duncraft.com, offers bird baths, bird feeders, bird houses, bird seed and foods, and more. Plus, they carry products for bluebirds & mealworms, butterflies, bees, hummingbirds, orioles, and bats. Shop the Duncraft brand or one of the other fabulous brands that Duncraft sells. Not only do Duncraft’s products attract birds, but they are a beautiful addition to your yard and some products even serve as solutions for problems in your yard. Before you head over to Duncraft.com, remember to check RetailSteal.com for all the best Duncraft coupon codes, Duncraft discounts, and Duncraft promo codes. Duncraft ships as a partner of Bongo International Parcel and Mail Forwarding and rates vary based on destination and price of order. See website for rates and details. Sign up for the food club at Duncraft.com and enjoy exclusive discounts. 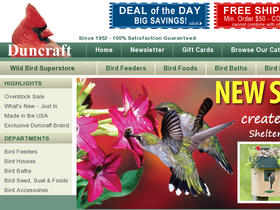 Shop online at Duncraft.com and enjoy a 100% guarantee on bird feeders, bird baths, seeds, and food. Give the gift of Duncraft quality with gift certificates from Duncraft.com.